Photopass has the unique opportunity to help guests capture memories through pictures that they can keep for the rest of their lives. 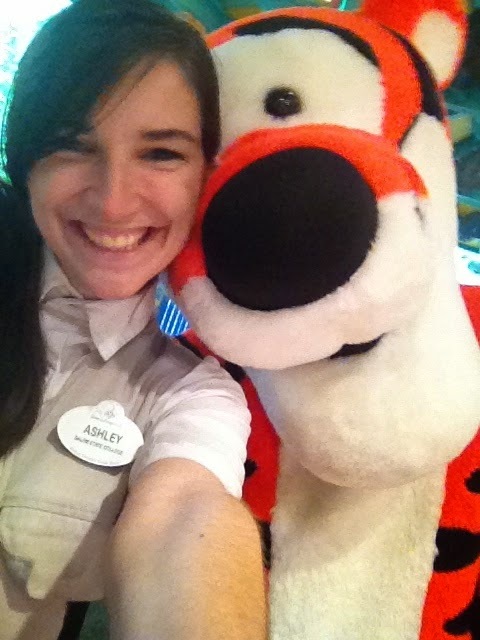 Ashley was able to experience this opportunity through her college program in Animal Kingdom. Here's what she had to say! I was lucky enough to be a PhotoPass Photographer at Animal Kingdom! I did Spring Advantage 2014! I usually got to work a little bit early. I usually worked morning to night shifts. I would park, and make my way backstage. I always got myself a sub from Subway for my break later on and would go sit in Base until it was time to clock in. Base was usually a busy place and I would catch up with any cast members that were in there. I was lucky enough to work with an amazing group of people. By the end of my program these people felt like family to me. After we clocked in we would pick up a blue bin from our coordinator that had all of our gear. We would have to set it all up and put it all one. This took me a while to get used to but everyone is always willing to help! South- Entrance of the park, The View station, and multiple locations on the bridge and plaza in front of the Tree of Life. North- Mickey and Minnie, King Louie and Baloo, Pocahontas, Everest Corner, Everest Bridge, Africa Drums, Tree back-side. East- Daisy, Donald, Goofy and Pluto, Dug and Russell. Once we ready with our gear we would hit CDS (cast deployment system) . Which deployment we assigned to depended on what location CDS gave you. I spent most of my program working in the North. When I was in the North, I always loved working with the characters instead of shooting one of the icons. Mickey and Minnie we amazing to work with, specially because they were in the AC. I was the most excited when I got East shifts because the day was filled with just characters. Getting to work with the character attendants and characters made the shift go by much faster, which made it more enjoyable. Goofy and Pluto were amazing to work with! They all messed around and could make anyone smile! Goofy loved to throw autograph books and pens at me all day. Working icons was a nice break from the busyness of characters, but was unfortunately usually in the sun. This made it hard because it go so hot in the summer. Being from Boston, I wasn't used to the heat! I loved being able to have guests do magic shots and create poses. This gave guests unique photos to remember their time in Disney. No matter where you working, Photopass is a very social job! We engage with so many guests all day long on a one to one level. We have to be outgoing, confident and excited for our job! The more outgoing and excited you were, your photos showed it! Once our shift was over, we headed back to base to turn in our equipment and to clock out. Since I usually closed the park, a whole group of us would all take the bus to the parking lot together, those bus rides were always interesting! Everyone I worked with was amazing!!! When I first learned about the college program, I wanted to be a photographer before I even knew it was possible. During my phone interview I expressed my interest in Photopass and talked about all of my experience with photography. Getting this role was beyond exciting for me and I couldn't have been happier! I am an Art Education major, and love children. Photography is a passion of mine. This role brought photography and working with children together for me! As every job at Disney there were many ups and downs! My favorite part was being able to capture families memories in the park. Years down the road families will look at my photos and remember certain moments of their vacation because of me. My other favorite was getting to work with all the amazing characters! Spending a few hours with Mickey and Minnie was truly amazing. Seeing them interact with guest of all ages was magical! From them seeing new born babies, recently married couples, children to people who were meeting them for the first time. The amount of times I cried while working with them can’t be counted… happy crying of course. My least favorite parts of my job is what every other Disney cast member hates.. the heat and the thickness of our costumes. But that is something we are unable to change! I was told before I went to Disney that I would be part of many magical moments. Little did I know that many of these would be life changing for me. I got to meet a little girl was very very sick. She was at Disney as a Make a Wish child. She was visiting Donald and Daisy with her parents. She was lucky enough to come when there was no one else at all in the area. She interacted with Daisy and did many cute poses with her. She came over to Donald and I instantly went picture crazy. Her parents approached me already crying and I soon realized the little girl was crying too. We brought Daisy over and let interact with both together. I can’t tell you the amount of pictures I took. There was not a dry eye around. The family thanked us so many times and gave us so many hugs. After they left we spent a good amount of time getting ourselves together for the next family. Once we all finally did the mom came back in crying again. She thanked us all again, and gave out another round of hugs. She gave each of us a little card thanking us for everything. All me and my fellow cast members did was do our job and let her take pictures with both of them together yet we made this little girl's vacation. She got to meet her two favorite characters regardless of how sick she was. I remember this day like it was yesterday and I don’t think I will ever forget it. 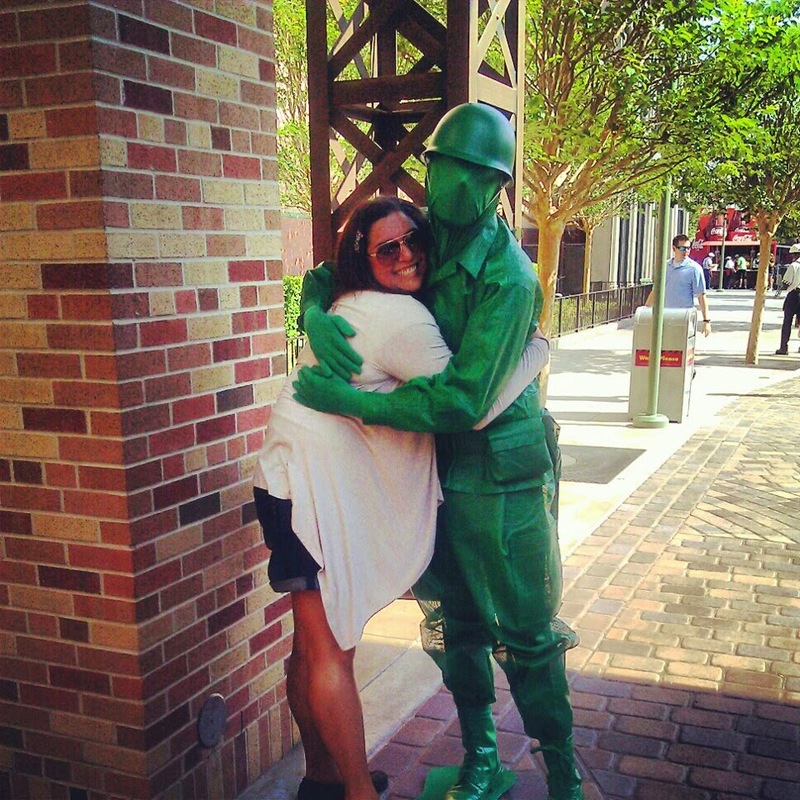 Cast members can do truly amazing things for the guests. This isn’t the only magical moment from my program. Sometimes simply getting a guest a new Mickey Ice cream sandwich made their day, or taking the extra 5 minutes to show a guest where to go. Magical Moments happen all the time while you are working! I told my parents when I was about seven that I was either going to move to Disney World or Australia. Of course, my parents laughed at me. I learned about the college program but was unable to do it at that time. I waited a year and decided to just go for it. What made me wants to do it from such a young age was just simply enjoying my vacations at the parks. I wanted to be part of it! 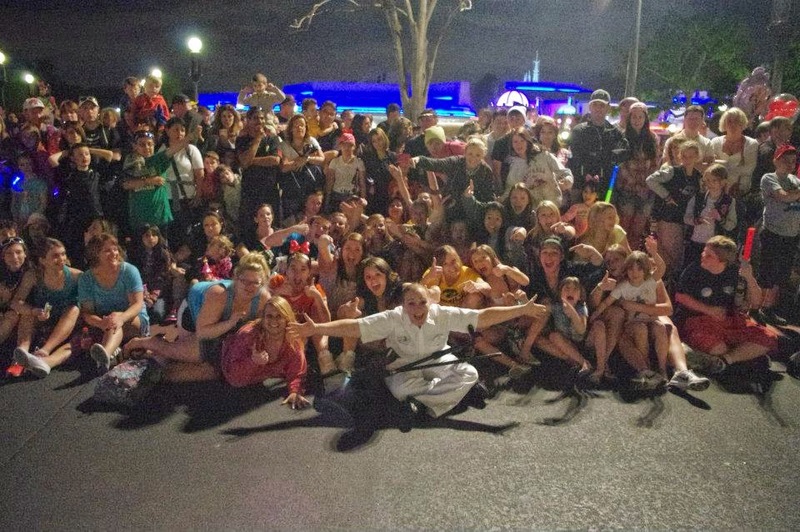 As I did research about the program I learned more about how much people learned and appreciated their time at Disney. I wanted to experience everything I was reading!! I wish before my program I understood how hard the program would honestly be. I knew we worked long tough days in the heat, but you truly don’t understand this until you worked a 13 hour shift, in the direct sunlight, with a heavy costume on, carrying your camera gear and dealing with hot angry guests. But as these days happened they were something to learn from. Each day is what you make it! For ever five rude guests, there's one guest who couldn't appreciate your hard work any more. Those long days become worth it! 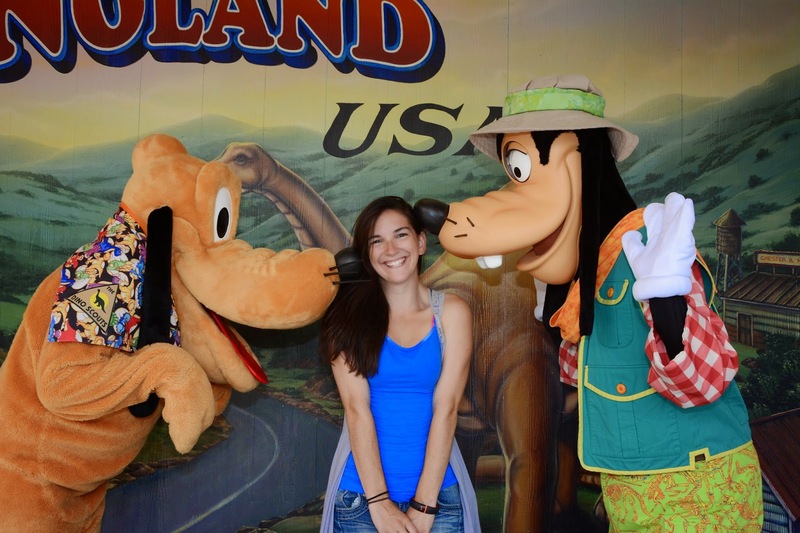 Ashley with Pluto and Goofy! What advice would you give to those who want to participate in your role? There's a lot of advice I would give to people interested in the DCP. Do all of your research before hand and talk to people who have down it before. That gives your a first hand experience of the DCP. Don’t just talk to one person but talk to many different people from many different roles! Its helps you be prepared and to know more about your future at the company! When you get the awesome email saying congratulations on being accepted, that is when your new adventure starts. When you finally get to move in, from day one take NOTHING for granted. Meet as many people as you can. Pick up shifts anywhere you can. Instead of going to bed early, go see Wishes for the 50th time. Go meet Mickey for the 20th time. Just eat ice scream on Main Street. Ride Space Mountain 10 times in a row. Because at some point your gonna have a week left in your program and you don’t want to leave with any regrets. Your last week, enjoy it with your roommates and your best friends. Say good bye to your fellow cast remembers and of course Mickey. This could be a once in a life time opportunity and take advantage of it!! I hope everyone has a magical day! Kayla in front of her store, World of Disney! Ever wonder what it's like to work in the largest Disney store in the world? 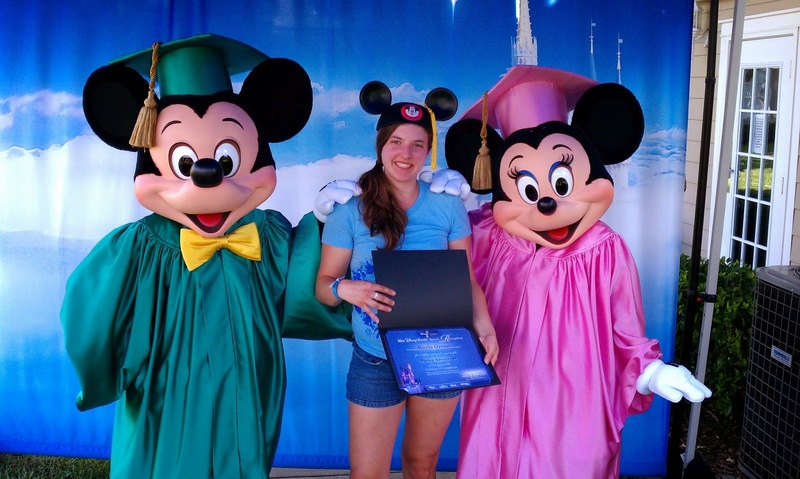 Kayla spent time to tell us about her experience at World of Disney during her college program! I was accepted into merchandise for the Spring Advantage 2011. 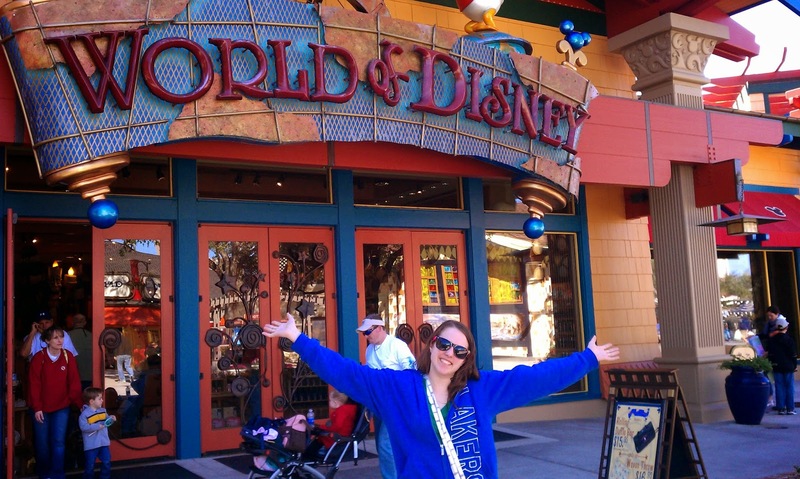 I was placed at the World of Disney (WOD) in Downtown Disney, which is the biggest Disney store in the world! It’s over 50,000 square feet! I would know ahead of time if I was going to be on a register or if I was going to be stocking merchandise for the day. If I was on a register, the computer would tell me to go to a specific terminal or go interact with guests by passing out stickers or playing with merchandise. I would do that for a few hours, then go on break, and then get a new assignment. This would repeat until I went home. If I was stocking, I would check where I was- and there were a lot of spots! WOD has 13 rooms, so I could be in any room or backstage organizing merchandise that needed to be put on the shelf. I also got the same amount of breaks as if I was on a register. I worked anywhere from 6 AM- 2AM for between 6-12 hours a day. I usually requested to have more hours so I worked the longer shifts for the most part and averaged 55 hours a week in the summer. It was my third choice (actually my third choice was attractions but I messed up in my interview and said merchandise). My first choice was concierge and my second choice was the Bibbidi Bobbiti Boutique, but I didn’t meet some of the requirements. I am so happy I worked at WOD. It is my favorite place I have ever worked! I loved talking to guests. Slow days (or parts of the day) were the best because I could give each guest more individualized attention. My least favorite part… well that’s a hard one. I didn’t like stocking certain rooms, especially the jewelry room. In this room specifically, there were so many products that all looked very similar it was hard to find where everything went, and it got messy very easily and very fast so it was hard to keep up on some days. I remember I was checking out a family and we were talking and I found out that they had their camera stolen while they were in the parks. Luckily, security found it but all their pictures had been erased. I asked if they had used PhotoPass on their vacation and they had, so with the help of my manager we let them pick a frame out so they could keep the happy memories of their vacation. That was the first time a guest asked if she could hug me. It was magical for both of us. I applied my very first semester of community college. I didn’t know what I wanted to major in so when I heard about the DCP I said that’s perfect! So I took some time off school and found out what I wanted to do with my life- work at Disney! Yes, you really need documentation with your name on it to get your parking sticker. And there is a free car wash in Patterson, you just need to bring your own soap and sponge. I didn’t wash my car for a year because Orlando is a tourist town, there are no car washes. It’s gross. Have fun! Pick up shifts at other locations! Since merchandise cast members can pick up shifts almost anywhere, it’s a great opportunity to meet new managers and get a change of pace from your location. I went to 7 different locations besides WOD and there were things I liked about all of them. Be careful, you might just want to spend the rest of your life at Disney. In all serious though, it is such a great opportunity to learn about how to work with people and how to network. All I ever heard was network-network-network, but I didn’t know how. Near the end of my program I found out that the Service Center at Vista has some great resources for this, so I would check them out. If you can, take the Disney Exploration Classes, you learn so much and all you have to do is show up and participate and you will get so much out of it. If you can’t, take the individual classes that are offered in one 2 hour block or so if they still have them. FOLLOW THE RULES. 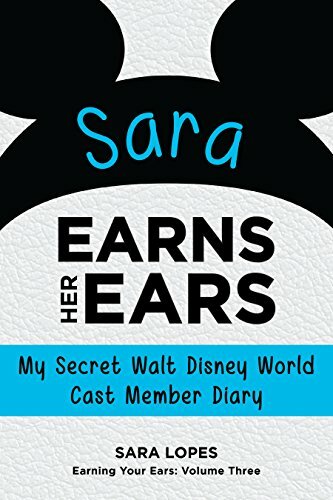 Is Disney strict on what they expect from you? Yes. Do they also tell you exactly what the expectations are? Yes. Don’t do stupid things and you will be fine and have the most magical time of your life. I started my program doing Quick Service Food and Beverage at Caribbean Beach and then later on went onto being on the opening team at Art Of Animation. Later on I had the opportunity to switch roles and then went onto working on Main Street USA at The Emporium in Magic Kingdom. Typical day doing QSFB consisted of me waking up at 5 AM and catching the early bus to work. Clock in at 6 AM and either be in a specific area of the food court or on register or cleaning and I was usually out by 12:30 PM and had the entire day off. Something went for working at Art Of Animation and working at Magic Kingdom, was a whole different story. I usually went into work anywhere from 3 PM to 11 PM and work through the night and the latest I went home was between 4 and 6 AM. Starting off doing QSFB, that was the role I originally wanted because I was a culinary student. When I went onto doing merch, I originally wanted Attractions but due to health problems and restrictions I had to kiss that role goodbye. But it worked out in the end, I found out I would have worked on Splash Mountain (I hate that ride) if I did attractions. Favorite parts? Just making magic for guests. Theres honestly too many things that were my favorite. Least favorite? Early hours, cranky guests, etc. Actually this was from my very last day on my program. A family came into the Emporium looking for a warm outfit for their daughter who had an accident. I showed them their options (which was just a pair of leggings) that were in their budget range. The mother really wanted to get the sweatpants but was upset because they couldn't afford them. I went over to my leader and asked for a no strings for an outfit. Once I got the approval from my leader, I went and got the sweatpants and matching hoodie and packed them in a bag and told the family to have a good night and enjoy their vacation. I didn't think expect to see the family again but I was wrong. The husband came back at the end of the Wishes wave and came looking for me. He found me and just thanked me and gave me a huge hug. He told me that they're vacation so far was terrible and people were rude and nasty and they were getting ready to just give up and go home early. I gave him my name and he got my picture and spoke to my other leader (who didn't witness the magical moment earlier). Before he left he turned back to me and said "It's people like you that make this place a better place for people to enjoy. Thank you so much for what you did for my little girl and she will never forget this trip". Till this day I still cry when I talk about it or think about it. Its moments like those that made my job worth the year that I spent. Actually a classmate of mine in my baking class would not stop talking about his experience because he just came back from participating in his program. As he went on about it, I researched it more and more and decided to apply on a whim. I pended for a month and found out I was officially moving to Florida four days after Thanksgiving. I wish someone would have told me how much I would miss Disney when I left. No one prepared me for the weeks of crying because I missed seeing the busses to get to the parks, or go park hopping or even just going to hang out at the parks with friends. No one prepared me for that. Be prepared for early early mornings and late nights. Rachel and her friend Sabrina! Any advice for the character performer audition? What should someone expect when they audition? I only tried out for the characters once for Star Wars weekends and it was extremely competitive. Make sure you come looking your best beyond the Disney look book and always make sure that you smile and look like you're having fun at all times. Dont second guess it, just apply. It will literally change your entire life for the better. 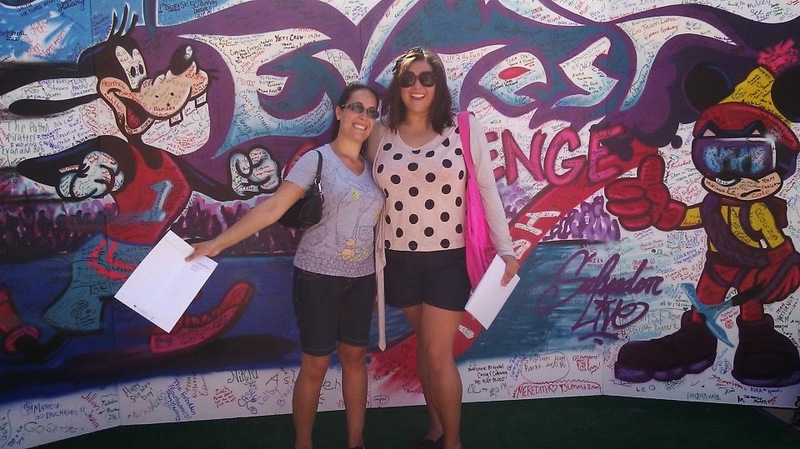 You'll meet people from all over the world, you have the opportunity to take Disney classes and learn while you work. And who could ever say no to free admission to the parks?! Getting to live on your own is fun too and I never lived on my own before the program and I loved the peace and quiet and bonding with my roommates. But enjoy ever single moment and don't take it for granted. P.S: I even ran my very first 5K at Disney and it inspired me to want to run more 5ks and I hopefully will be doing my first half marathon in the future! Nikki in front of Be Our Guest during her last shift! Imagine spending every day getting paid to walk and maintain the beauty and cleanliness of the wonderful Magic Kingdom. Nikki was able to do this during her program, and created some wonderful memories that she was kind enough to share with you! 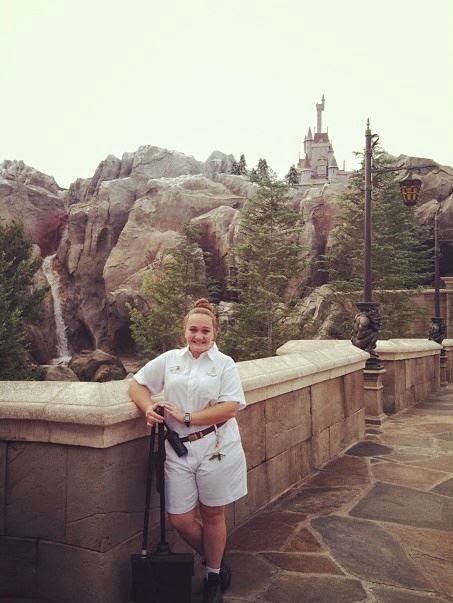 I was custodial in Magic Kingdom east, which took care of Fantasyland and Tomorrowland. It depended if I was assigned to a restroom or on a streets shift. In a restroom, your only responsibilities are to keep it looking pretty much perfect; no toilet paper on the ground, no messes on the seats, making sure toilets are flushed, trash cans are emptied when they are full and keeping the water off the sinks. If I was in the streets, my day consisted of picking up trash off the ground and sweeping it into my pan, sweeping up popcorn at ninja-like speeds before guests can see it on the ground, and emptying trashcans assigned to my zone. In the streets you are also responsible for any codes that happen in your zone; Code V (vomit), Code H (feces), BBP clean up (blood), etc. If you are assigned to a zone with an attraction, you are also responsible for all trash cans inside the attraction, along with any codes that happen. It sounds like a really terrible job, but I promise it’s not. You have the most room for guest interaction, which leads to making magical moments! I said to the woman on the phone that I would gladly take any role, but when I got my email telling me I was Custodial, my heart dropped. I began to research it and everyone was telling nothing but horror stories and I dreaded it. Looking back on it now, I couldn’t have asked for a better role and when I move back down in August 2015 I’m applying for custodial part time. Obviously no one enjoys cleaning up codes, but Disney makes it really easy to clean any code...yay efficiency! I’d have to say that [cleaning up codes] was my least favorite part. My favorite part was hands down making magical moments. In custodial, your costume is universal throughout ALL of Walt Disney World. Because of this, if in order to make a magical moment you needed to go from Tomorrowland to Adventureland, you could, because your costume does not restrict you to a certain area. It’s great. Gosh, I have so many. Ok here’s a good one. It was my last night of work, and I was crossing the bridge going to clock out after I had spent the day working in the Be Our Guest bathroom. I was sad for a number of reasons, as my program was ending, but I was really upset because I had not seen a single proposal during my program. It's pouring rain, and there's a couple leaving BOG, dancing in the rain, and running. Normally, I would have said something about them running, but whatever, last night of work, don't want my last guest interaction to be a negative one. The boyfriend slips and "falls" onto one knee, and proposes right there in the pouring rain. I stopped dead in my tracks and BURST into tears (oops). the girl said yes and a group of their friends came running from the Gaston area to congratulate them. I told one of their friends to make them stay put while I ran to The Fantasy Faire Gift Shop and explained to a manager what I saw. He gave me the bride and groom mickey ears for a magical moment. I went back, and told the couple that Belle and the Beast had been watching from the library and wanted to congratulate them on their engagement. I handed them the hats and the girlfriend started to cry. Her boyfriend explained that the whole trip she had been wanting a pair of Mickey ears but they couldn't let themselves pay over $20 for it. I took some pictures for them, crying the whole time, and told them it was my last night as a cast member. The couple took a picture with me, hugs all around, and then I went to clock out. Thinking about this makes me choke up every time, but I honestly could not have ended my program on a better note. I’ve always been a huge fan of Disney. When I went in 2011 on my senior trip I asked a girl working at Pizza Planet how she got her job here, and she told me she was on the Disney College Program. I did my research once I got home and my mind was made up. There is NO NEED to bring every article of clothing you own. I was working so much, I think I only did laundry like four times on the program because I barely wore street clothes. You don’t need 40 pairs of shoes, ladies! Nikki's "fan club" before the Electric Parade! Don’t listen to the horror stories. Make the most of the role, and make as much magic as possible. The magical moments really outweigh the terrible days. I only went to one character audition, before my program, in Philadelphia. There was like 400 people there. I have a background in dance and theatre. I didn’t make it past the first round. I just wasn’t what they were looking for today. Don’t give up! If it’s really what you want, keep going, make big movements and get them to look at you without being obnoxious. The audition process was like this- I got there, they gave me a number. They called people in groups of 30. We learned a really simple dance combo, and then did it in two lines for the judges. After everyone was done the first round, they called a bunch of numbers and said anyone who wasn’t called thank you, you may leave. My friends made it through to the next round and said the dance combo was a lot harder, and more advanced. One friend made it all the way to the end and got fitted for a wig, and had her pictures and measurements taken. If you make it to the phone interview, know why you want to work for the company. I had a little script written out and knew what I wanted to say. Also, do not give up hope. I was denied four times until I was finally accepted. The DCP has been the best thing to ever happen to me and it was so worth the wait, because if I hadn’t gone on my specific program, I wouldn’t have met the people I met and my life wouldn’t be the way it is today. Keep moving forward, and never lose sight of your dreams! Carmela in the Grand Floridian! I had the pleasure of interviewing Carmela and learning about her experience in two different roles during her college program! It's always interesting to hear a person's opinion and compare their experience within the different roles. Let's see what she had to say! 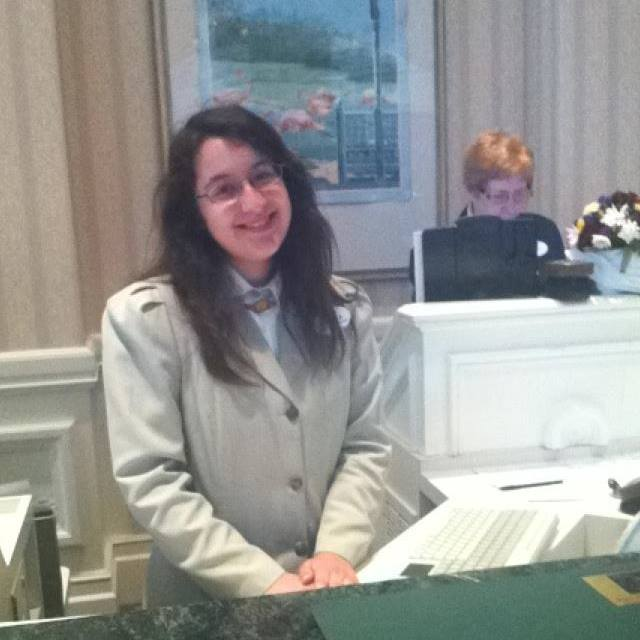 I was a Concierge/Front Desk at the Grand Floridian for the first half of my program! Then I extended and was attractions at Dinosaur in Animal Kingdom! For Concierge I would make sure to answer every guest's questions. I mostly got questions about My Disney Experience and magic bands since they still confuse people since they are fairly new. I dealt with magic bands all the time and I learned to love the new system! I also got to sell park tickets, book dining reservations as well as recommending places to eat/shop! That was my favorite part! I loved sharing my knowledge of Disney World to all of my guests that I encountered. One day, I spent an hour planning this family's vacation because they have never been to Disney World before! I loved my my job! It can get repetitive but I never got bored. I had live music playing during my shifts all of the time. I loved listening to the band! They played all of my favorites: Disney tunes, Dixieland music and jazz. When I wasn't in the lobby, I was at lounge. Lounge is mostly in Deluxe Resorts. I would serve the food on the buffet tables and make sure everything is restocked and clean. Not a lot of people liked lounge, but I enjoyed it. Sometimes managers would let you "test" the food for "product knowledge." As CP's, you would almost always get at least 2-3 lounge shifts a week. At Dinosaur I could be placed at various locations. Tower, which is the eyes and ears of the entire attractions, AKA the most stressful thing ever! I also was placed at Greeter (my favorite), Fastpass, Grouper and most important belt check! I liked attractions but it was REALLY stressful! I loved Concierge so much more. Concierge was my first choice and I cried when I was accepted into it. Not going to lie, when I found out I got accepted to extend into attractions I was very upset. I felt that it was a demotion and a major step down. But, I did enjoy working at Dinosaur! I met great people and it was nice to have had the opportunity to work in a resort and a park! I loved everything about Concierge! I would have to say that the one part I didn't like was standing in one spot for 8+ hours. Concierge is more flexible than Front Desk and I don't think that it is repetitive like people say. I enjoyed every moment of concierge! At Dinosaur, I did not like Tower. I was very overwhelmed and one mistake could cost you your job. 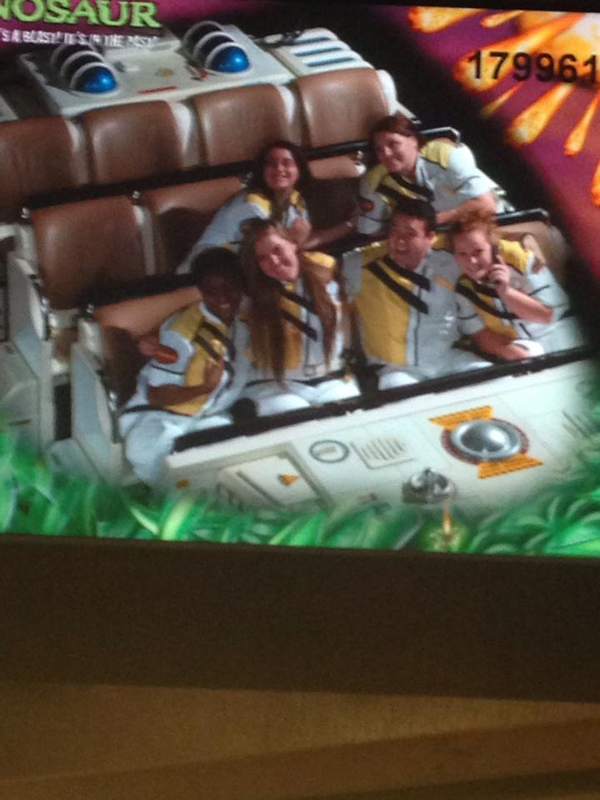 Carmela and her coworkers on Dinosaur! (Not even kidding). Since I transferred from Hospitality, I was not used to saying "No." That was hard for me. It was upsetting to turn away people if the child was too small to ride. I felt that attractions isn't for me because it is very safety oriented and very uptight. You have to be alert at all times and even if you sneeze or blink something could go wrong in an instant. Also, every time I went to work, I was always afraid to do something wrong and get a reprimand. If you are a nervous person, like myself, attractions is not for you. I did enjoy my time at Dinosaur though, it was a great experience! I had so many wonderful moments with guests! At Concierge, like I said before, I helped a family plan their vacation for over an hour and they were so grateful! They would come visit me throughout their stay every day and would tell me about their day! They would always ask me if I would be working tomorrow, and when I said "Yes" they were so excited. They were so adorable and it made my week that they were so appreciative of what I did for them! At Dinosaur, I had a task called "Make a Magical Moment" along with another coworker. I had a Dinosaur vest, a construction hat and scientist goggles. I stood at greeter and waited for a little boy and ask if he would like to be an "Honorary Technician" then I would get the family through Fastpass and get them a free photo from the ride! I found a little boy and he was so excited! His parents told me that the son wanted to ride Dinosaur again but they didn't think that they could because the line was so long! They were so grateful that we got them through fastpass! I'm glad that I picked the right family! Lastly, I was training for Concierge, and a little girl kept looking at my name tag. The father finally said that his daughter had the same name as me! It was awesome because I never met a Carmela that was younger than me! The little girl asked if I can take a picture with her so she could put it in her scrapbook! I was so honored to be in her scrapbook! 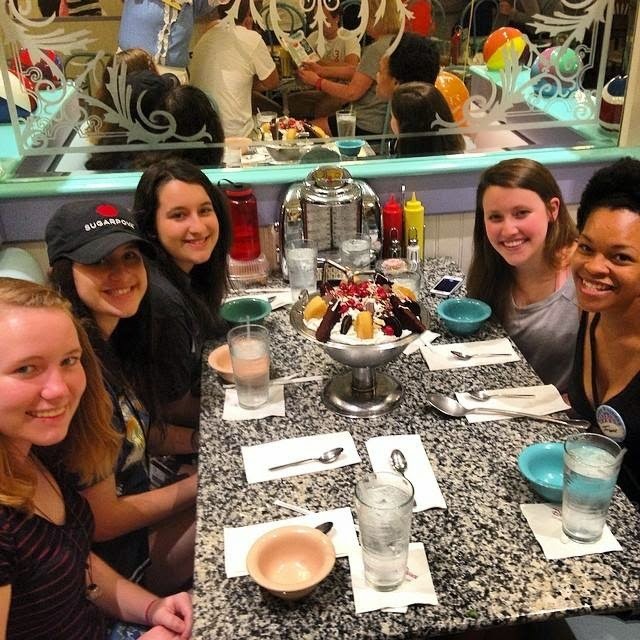 At Beaches 'n' Cream to conquer the Kitchen Sink! Not really! I had no regrets! I came in with a very opened mind! For Concierge, make sure to product knowledge! Go to as many restaurants as you can, including quick service! Explore the parks! If you do not have the time to do so, research ahead of time. Before I went to Florida, I studied the whole Walt Disney World Resort map. I also studied the surrounding area. It is really helpful to know your way around because a lot of people will ask about Churches, malls, etc. For attractions, be prepared to be very alert! Don't be nervous! I was really nervous and I had to keep telling myself not to be!